Last night, I decided to treat myself to a good book. I have several sitting on my Kindle waiting to be read, but Ebooks + bubble baths aren’t a wise combination. Alas, the one downside of physical books is that you have to…gasp…wait for them to arrive at your door. And so, I will just have to wait until tomorrow for my book/bubble bath combo. In the meantime, I figured I might as well whine about it on the internet. 😛 You’re welcome. 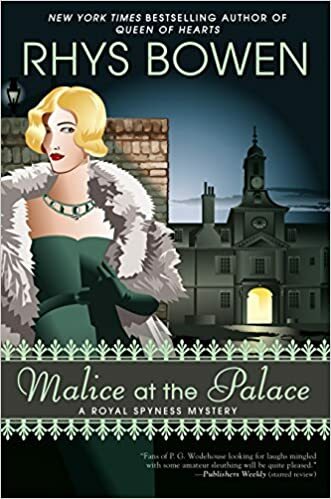 The book currently making its way to my door is Malice at the Palace—the newest in the Royal Spyness Mystery series by Rhys Bowen. Any other Royal Spyness fans out there? I love this series and promptly devoured every book as fast as possible immediately after I discovered it in 2013. For those who aren’t familiar, the series is set in 1920’s-1930’s Great Britain and features Lady Victoria Georgiana Charlotte Eugenie (aka Georgie) as the main character. Despite being 34th in line for the throne, Georgie’s father’s gambling habit has left her broke. Unfortunately, it is frowned upon for a member of the aristocracy to join the working class. So, Georgie has to find creative ways to support herself. In the process, she gets caught up in a number of mysterious murders. That description really doesn’t do the series justice–it’s well-written, humorous, and chock full of interesting characters. If you like cozy mysteries, I highly recommend you check it out. Go directly to Amazon and order the first book now! The sooner you do, the sooner it will be on your doorstep (you don’t want to end up wallowing in impatience like me, do you? ).